2243 ⊙ 311, 321 France - 1849 / 1944, extensive used collection in a large stockbook formed, from the beginning condition varies, otherwise mainly in good condition with plenty of better issues, many superb in every respect (choice copy) and pieces in outstanding quality. Thereby also good part classic including Michel no. 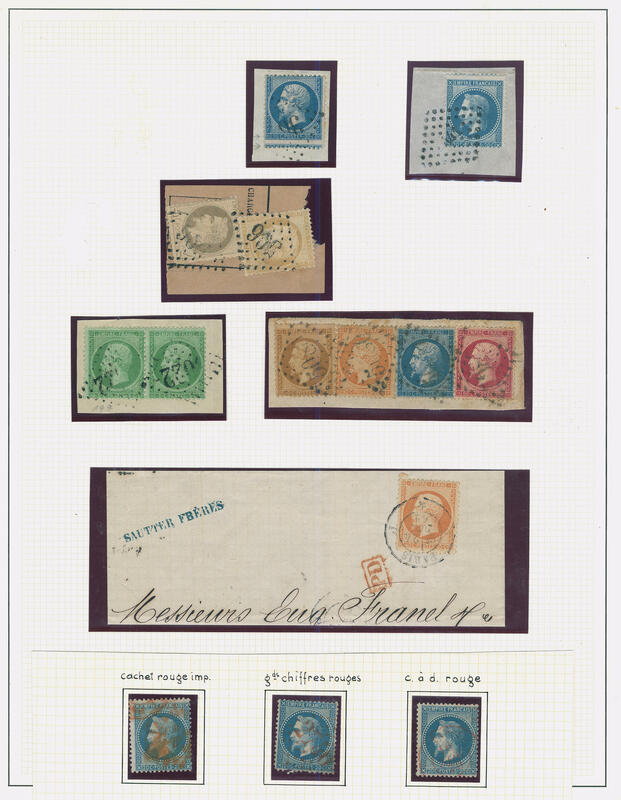 1, 5, 7, numerous Napoleon issues unperforated and perforated including 5 Fr., covers and letter pieces, war orphan sets, Philatelic Congress Bordeaux 1923 on magnificent letter piece with special cancel, airmail set 1927, 50 Fr. Airmail 1936 (Michel no. 311), 50 Fr. Bill (Michel no. 321), PEXIP-souvenir sheet 1937 and numerous further issues, complete sets and so on. Magnificent object with very high catalogue value! 2244 France - 1945 / 83, very nice and cultivated mint never hinged collection in three Lindner hingeless printed form ring binder, complete with all issued stamps. And, of course, famous French peoples 1954 / 55, airmail 1954 and all further issues. Also the scarce so-called \"kinglet\" is in perfect condition mint never hinged from margin of sheet available and expertized Cousin. A wonderful quality object! 2266 ⊙/ France - 1945 / 66, rich collection in the safe ring binder, as well numerous special- and commemorative sets, Citex souvenir sheet 1949, famous French peoples 1944 / 45 complete, airmail issues and so on. A beautiful object! 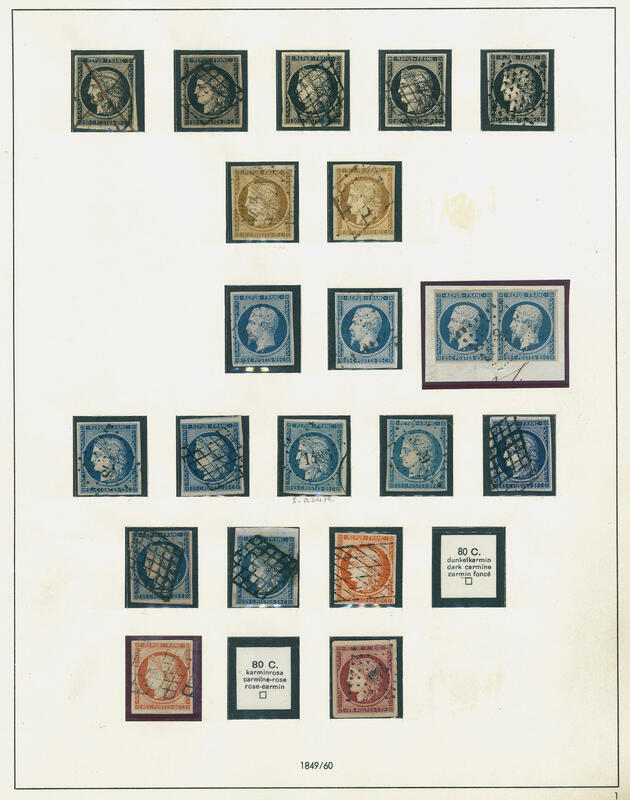 2304 x France - interesting inventory packed in a carton with numerous issues from the classic including much older material, a number of issues on stock cards, special- and commemorative sets, louvre 1937 on special card and so on. Favorable treasure trove! 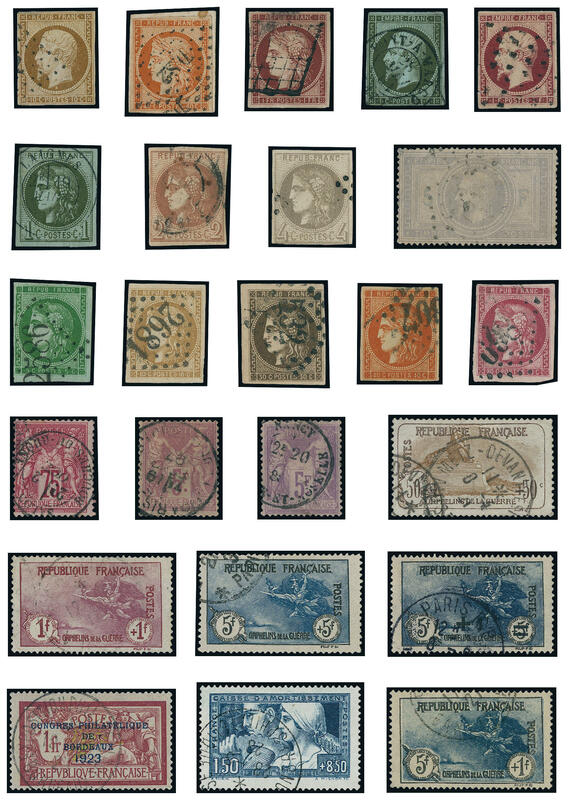 2380 France / nominal - nice inventory from post valid mint never hinged issues, very assorted, with also nice motives and so on. The from us calculated nominal value amounts exactly 7000,- FFr. 2404 /⊙ France - 1946 / 65, rich collection in the safe hingeless printed form ring binder with numerous different issues, complete sets, complete volumes, famous French peoples 1954 mint never hinged and 1955 used, advance cancellations and so on. Favorable opportunity to acquire one nearly complete collection! 2409 ⊙/ / France - 1849 / 1945, rich collection in the safe hingeless printed form ring binder, mixed quality, with much perfect material and better issues. Is included also an interesting part classic, with also 1 Fr. Ceres, further issues Napoleon and Ceres, war orphan 1922, center piece from the Strasbourg souvenir sheet used, grin from Reims, louvre 1937, special- and commemorative sets, postage due stamps and so on. Interesting object with very high catalogue value! 2421 ⊙ 311, 321 France - 1849 / 1996, extensive used collection in two thick Schaubek illustrated albums, outstanding set with numerous expensive issues. As well the classic very well represented, condition varies, with superb and extremely fine copies, otherwise mainly good condition with numerous rarely issues. With also Ceres cut with Michel no. 1 / 5, 7 a, Napoleon unperforated with Michel no. 8 / 9, 1 Fr. Napoleon expertized Calves, the perforated issues including 5 Fr. Napoleon, the Bordeaux issue 1870 complete used, type share with different types, war orphan 1917, further good sets war orphan, Paris souvenir sheet 1925 with edge fold, Bordeaux congress 1923, 10 Fr. Red Hurried de France used expertized Calves, good issues national debts redemption fund, airmail 1927, 50 Fr. Airmail 1936 (Michel no. 311), 50 Fr. Bill (Michel no. 321), Atlantic flight 1936, Strasbourg souvenir sheet 1927, PEXIP-souvenir sheet 1936, as well the post-war period in the number of a major listing complete including famous French peoples 1954 / 55 and so on. 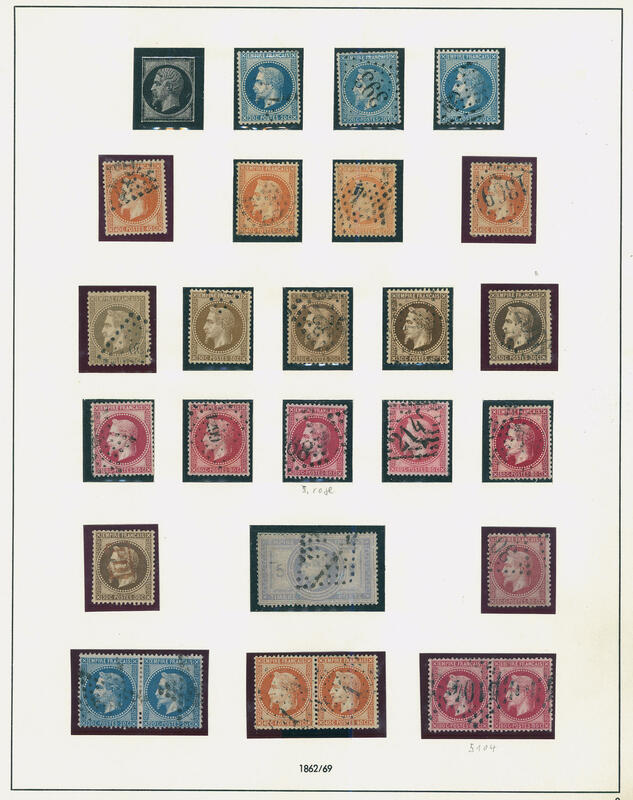 Also the postage due stamps are represented strongly with better values from the years 1859 / 1943. A magnificent object with substance and very high catalogue value! 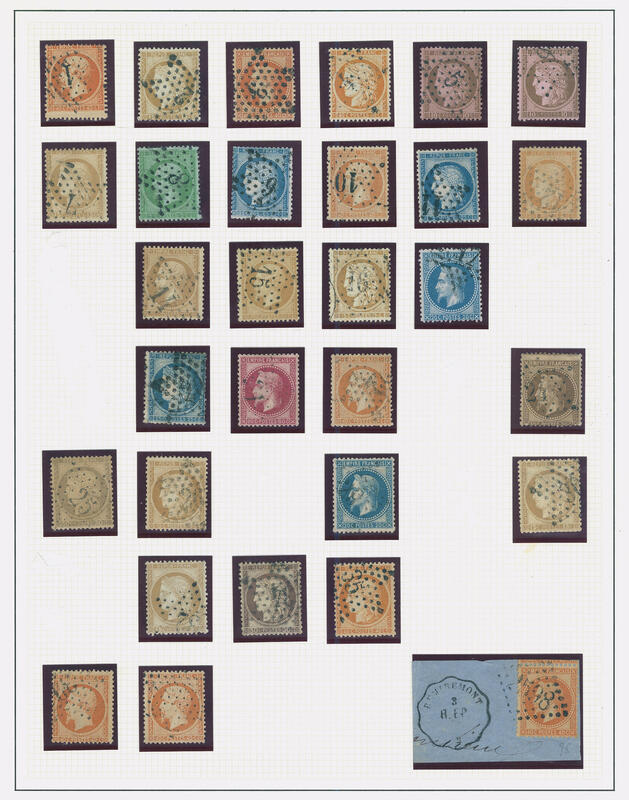 2448 /⊙/ France - rich collection from the classic formed in the spring back binder, as well cut and perforated values Ceres and Napoleon, type share, older special- and commemorative issues, famous French peoples 1955 and so on. Very high catalog value! 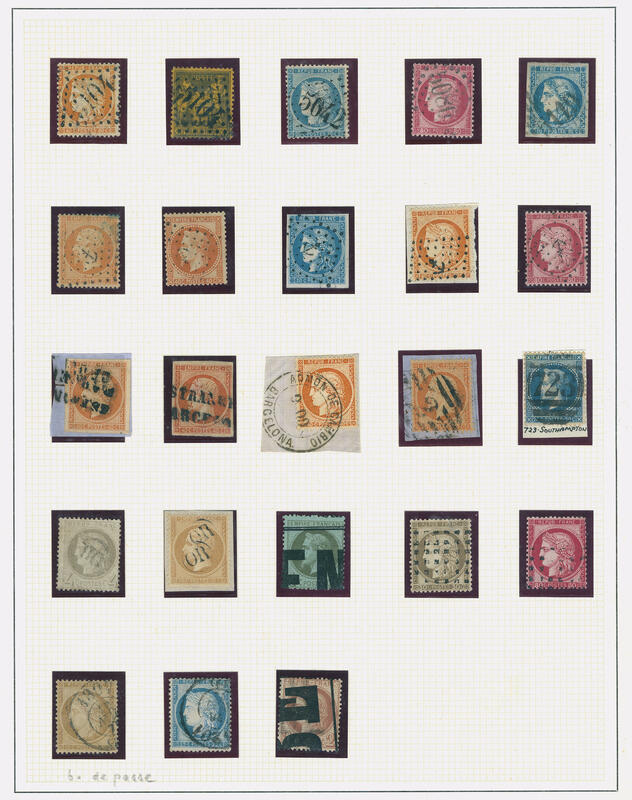 2501 / France - 1870 / 1944, nice and rich collection with numerous good issues in the safe hingeless printed form ring binder. As well better issues, gutters, good values Merson, Red Cross 1918, war orphan sets, an interesting part advance cancellations, issues for the government debt Cancellation cash register, very nice part thirties with special- and commemorative sets, PEXIP-souvenir sheet 1937 with missing control punching, louvre 1937, 50 Fr. Ader in both colours, 1, 50 Fr. Blue with punching \"EIPA\", postage due stamps and so on. A magnificent object with very high catalogue value! 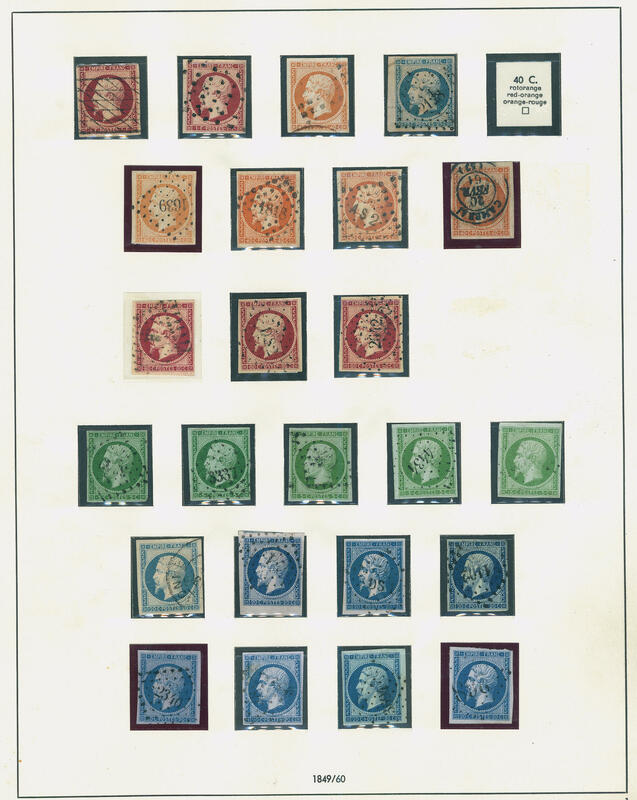 2502 ⊙/∆ France - interesting and extensive lot of only old issues from the classic formed in the stockbook with numerous better values, slightly mixed condition, with many superb and extremely fine copies. 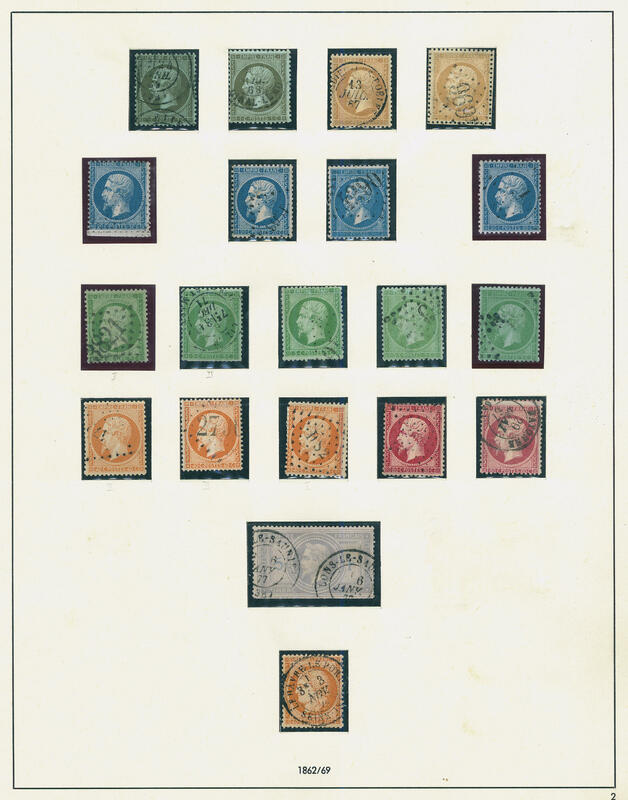 With also colors, shades, interesting cancellations, cut issues Ceres and Napoleon abundant, the perforated issues Ceres and Napoleon well-staffed, Bordeaux values including better issues, as well allegory with better values, different types and so on. A delightful inventory with enormous catalogue value! 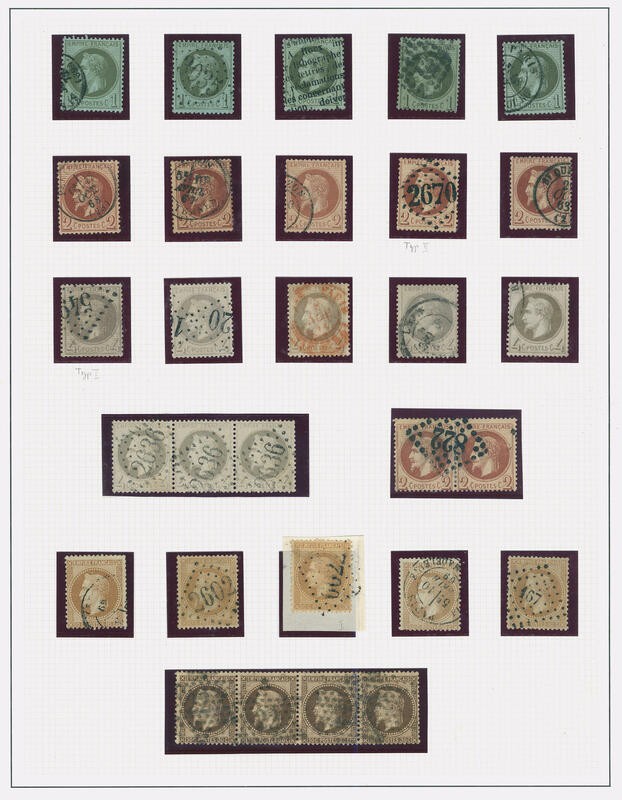 2554 ⊙ France - 1945 / 2004, very nice and cultivated used collection, in the number of a major listing complete in seven beautiful Lindner T hingeless printed form ring binder with all special- and commemorative issues, famous French peoples, airmail and so on. Besides is a very large part miniature sheet and stamp booklet available. Exceptionally beautiful and Cultivated quality object! 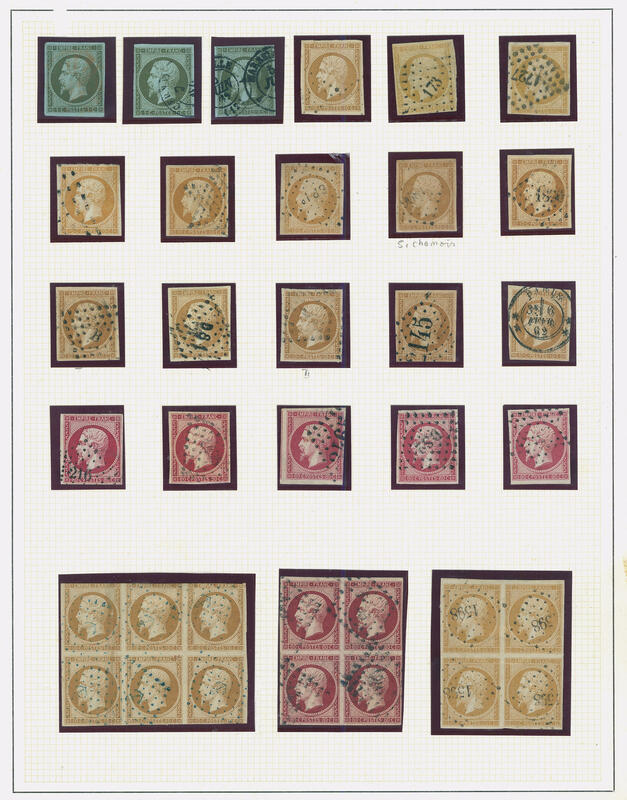 2577 ⊙/∆ 1 France - very nice and rich special collection the issues Ceres and Napoleon cut respectively perforated, abundant formed and nice specialized in the safe ring binder, condition varies, with numerous superb in every respect (choice copy) and pieces in outstanding quality. Many better values as for instance also Michel no. 1 twice in different color shades, 4 twice in different color shades, 1 Fr. Ceres, Napoleon cut well represented, also the scarce 1 Fr. Twice in mixed color shades, also multiples including pairs and strip of three, blocks of four to there to the block of six, 5 Fr. 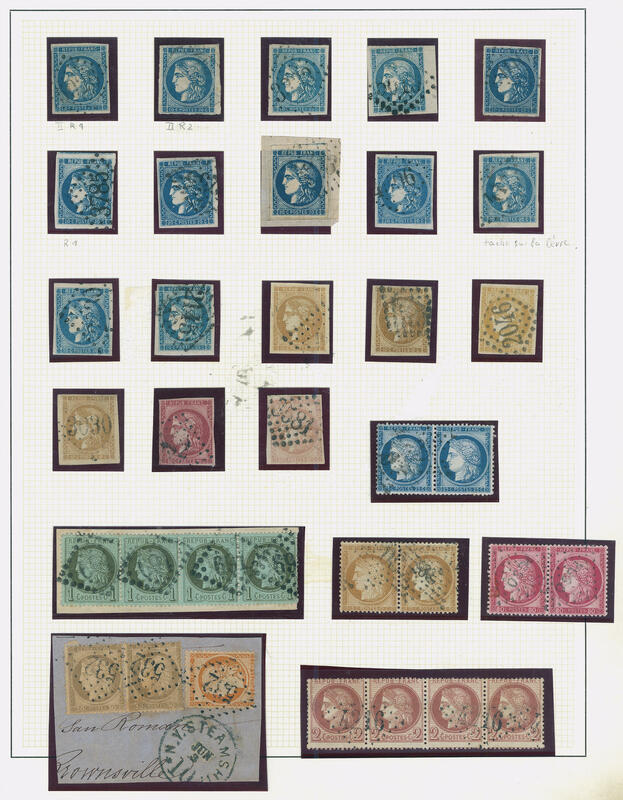 Napoleon, numerous nice cancellations, with also various number postmark, mixed postmark types and -colours and so on. An attractive exception object with substance! 2578 x France - interesting and extensive inventory packed in a carton with a lot of material from the classic, as well numerous better issues, Ceres and Napoleon unperforated and perforated, better special- and commemorative issues the pre-war years, national debts redemption fund, 10 Fr. Atlantic flight, 1 Fr. Ceres, better Bordeaux values and so on. Treasure trove with gigantic catalogue value! 2684 ⊙ France - 1849 / 1989, extensive used collection in six lighthouse hingeless printed form albums formed from the classic with numerous values Ceres and Napoleon perforated and cut, many further older issues, as well an extensive part post-war period, with also famous French peoples 1955, many special- and commemorative sets, complete years, partly also filigreed with beautiful documents, illustrated First Day Cover and so on. A magnificent object with very high catalogue value! 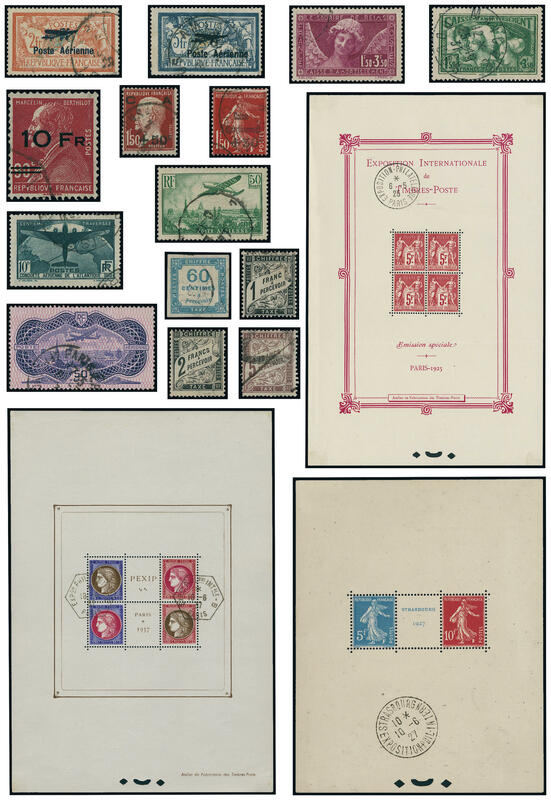 2709 / France - 1900 / 89, nice and rich collection in two illustrated ringbinder formed, mainly mint never hinged with a wealth from special- and commemorative issues, complete volumes, many sets and so on. As well pre-war issues, as well an extensive part from 1945 including famous French peoples 1954. A beautiful object with very high catalogue value! 2710 ⊙ 305/11 France - 1849 / 1975, very interesting and extensive collection in the Bernina spring back binder, mixed, with many superb and extremely fine copies, better values, as well extensive part Ceres and Napoleon cut respectively perforated including color shades, different cancellations, extensive part type share likewise with color shades formed, special- and commemorative issues, nice part twenties and thirties, airmail stamps including Michel no. 305 / 11, 326 / 27, as well a very large part post-war issues. An interesting object with very high catalogue value!